What can be said about Three Cups of Tea that hasn't already been said? Greg Mortenson has been picked apart because this story sounds like an over exaggeration of one man's talents. This book practically heralds him as a god. As others have pointed out, the book appears on its face to be co-written by Mortenson and David Oliver Relin. However, it soon becomes clear that the author of the book is Relin and he has a very slanted opinion of the man he is writing about. This book has begged the question of whether or not Relin/Mortenson are making up facts to please themselves or if Mortenson is truly out saving the world. I should tell you that I read this book under duress. (Heh. Bookclub.) I had tried reading this book a few years back, when it was The Most Popular Book in Existence EVER, and couldn't get over the voice of Relin who clearly stands in awe of Mortenson. Then I later heard that the claims that Mortenson makes about his feats of bravery and self-sacrifice were actually hogwash. Apparently when 60 Minutes tried to investigate his claims, he expressed his desire not to cooperate which, again, begs numerous questions. 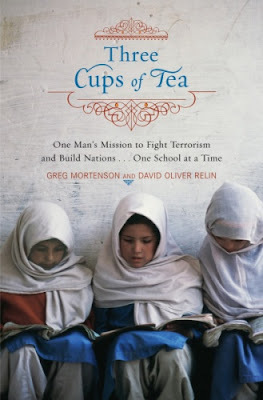 At any rate - should you (by some miracle of the modern world) not have been made aware of this book, it is about how Mortenson raised funds to build a school for girls in "the wildest parts of Pakistan and Afghanistan." This story takes place before 9/11 and you have to keep reminding yourself of that fact as you read along because our post-9/11 world wouldn't allow for the half of the stuff Mortenson claims to have happened to actually happen. 1. It's anti-American stance on every conceivable subject. 2. Mortenson's clear disrespect for the time of others, including that of the author himself. As to point number one, I disliked the book for suggesting over and over again that Americans are closed minded nitwits who are so uppity about themselves that they pay no mind to the rest of the world. (Every country has its faults. Not saying that Americans are perfect. I'm just saying that we shouldn't always treat them as if they are collectively imperfect. You don't want us to generalize about other cultures? Don't generalize Americans either. All's fair.) Unfortunately I didn't bookmark the place where the author referred to "America's war" on terror as if it were all about us. After all the hype about Mortenson overlooking differences and (literally and figuratively) climbing mountains to obtain the ever elusive world peace, I was really annoyed. Who STARTED the war? We didn't bomb ourselves. I'm not saying that it's not good to be at peace with all men in so much as it is possible, but I do become frightfully annoyed when America is always painted out to be the big, bad guy and all other cultures and customs are thought to be superior somehow. I'm glad and proud to be American. And we've paid dearly to remain the home of the free. (Well...considering your politics and the state of taxation...mostly free.) And we've earned the title "Home of the Brave" because we're loaded down with brave men and women who have fought to preserve this country. Why do we so easily brush it aside in some sort of facade based on intellectual pride? 2. Mortenson is apparently notoriously bad about wasting the time of other people. The author confessed that in the writing of this book, Mortenson seldom kept an appointment and was habitually late. The author proceeds to explain how you eventually overlook this fact about Mortenson because his brilliant compassion causes you to realize that Mortenson is really another species, high above the rest of humanity, and that his lack of manners should be excused. Apart from what Mortenson may or may not have accomplished in building these schools, his personality is one that I could never get along with. He surrounds himself with people who think well of him and dismiss his flaws as being just part of the package that is Mortenson. His wife and his mother say that he operates on "African time" - which apparently involves coming and going as one pleases without ever looking at the clock. That might be a nice idea (in theory) of a way to live one's life but we also can't ignore the fact that Americans do run things by the clock. So whether or not Mr. Mortenson chooses to do so is rather irrelevant to me because by failing to acknowledge that other people have lives that they are also trying to live and be productive in, he is inadvertently claiming that he is the most important person on the face of the planet. He dismisses the fact that other people have responsibilities and cares and insists that everyone accept him just the way that he is and adapt. That is very selfish and flat out sinfully rude. Time is a valuable commodity and we've all been given tasks, jobs to do, responsibilities and goals that are our own and to take time out of one's life to give to another should be considered a gift. Mortenson squanders the gifts and time of others by making them sit around for hours waiting for him to show up for an appointment or by ignoring them completely when they've offered something of themselves for his work. Really? Bowing down to him? Because he has less money but Lives For a Cause? Does this make him better? Does this make him god-like, with a passport to do as he pleases? We've all seen this happen with others, no doubt. Someone says that they believe in something that they deem important and everyone around them is expected to get on board with the program come hell or high water. If we don't, then somehow we're in the wrong. Clearly, we have the incorrect mindset. We should give all of our money, time and energy to their cause because our own responsibilities must be nothing in light of their perceived notion of right and wrong. Mortenson's mother surely loves her son (a good thing!) but I think she places too much emphasis on his perceived importance. On the whole, I'm neither impressed with Mortenson or this book. Character is more important to me than money or worldy successes. I'm not saying that his work is invaluable because I don't believe so. But I do believe that there are a great many people in this world doing good and valuable work and while it would be wonderful to hear their stories, one by one, I would be hesitant to say which life mission was the better. I think a sense of humility will carry a person a lot further than pride will. I believe that God can use any person on earth to accomplish His will, and that we shouldn't worry so much about patting ourselves on the back for what we do but purpose to do everything for the glory of God. If that is done, then purposes are accomplished - no matter what they might end up looking like through human eyes. Would I recommend this book? Well, it's not a book that means very much to me because of Mortenson's treatment of others and Relin's clear fascination with his subject matter. It's hard to tell what is true and what isn't. The only thing that is clear, from the author's perspective, is that Mortenson is a better human than myself (and pretty much everyone that I know) and if you want to read about how much you and your concerns are worth absolutely nothing, then by all means - read this book!!! P.S. If you are an American who has family serving in the armed forces to protect our freedoms, then this book might just flat out make you mad. I never read this one got it from the library but just never picked it up. I heard this was some disputes with his story. HUH! I don't know if I had heard all the controversy over this, but you certainly made it clear. When I saw the title, I was VERY curious what your thoughts would be. I do remember all the claims and anger about this book. Wow. I actually hadn't heard anything about this book; I thought the cover looked particularly nice. Thanks for your review, though. It doesn't sound like something I'd be interested in. I started this one and never finished it. Then I read the young reader's version. I agree with your general sentiments, though I didn't zero in on my reactions as well as you've done here. Thanks for saving my valuable time ;-) I will definitely skip this book! I have never commented before, but I did not like this book or the story AT ALL!!!! Thanks for your honesty! Honestly, he as a character didn't bug me a whole lot, but we've been over this. Heather's tolerance is awfully high...too high sometimes. As for the America thing, I wasn't too bothered by that one myself. There were SOME parts that I was like...oh come on! But I sort of passed it off as general "liberal do-gooder America" talk. Not dissing liberals, just saying, they tend to talk like that. But you are right, sometimes it's like, "prideful Christians" or "big bad Americans" or "oppressive males" just start to seem like things we've just heard about waaay too often. Not to say Christians are never prideful (though they shouldn't be), or Americans are never big and bad, or men never oppress women. But it just seems like we've become a little myopic about it...as a culture. That quote from Mortenson's mother certainly leapt out at me though. Although, I think people who go out in the world and do "big things." Whether it's big things for Jesus or big things for...themselves? humanity? some hole they are attempting to fill? Tend to be a little....(believe me I'm trying to think of the kindest way to say this) sure they and no one else is doing the right thing. I say TEND to be cause I know a lot of lovely missionaries who know that they are called to go out into the world whereas someone else might be called to be a delivery truck driver. And it could be that they ARE doing something wonderful and helpful and great, and they are so excited about it that they can't understand why you aren't as well? Or...they are just a little uppity about their life mission. I'm glad I read it because it was one of those books that everyone ever reads. ever. And so I'll be able to discuss it with plenty of other people. But...your closing comments I think I agree with. Whoa! Sorry for the ramble. haha! Never heard of it. I had to laugh at "African time." It's very similar to "Asian time." My husband grew up in Africa and Asia. The cultures just operate on a different understand of time and appointments. They don't mean offense. It just is what it is. However, I think you are right that when in America where people expect punctuality then you should operate as such. Being late or skipping a meeting is like saying the other person's time is not as valuable as your own. Makes me crazy! I've never read this and only barely heard of it. It's funny, I was listening to NPR on the car radio when this book came up -- they said apparently some readers are forming a class action suit against him for fraud. I do get tired of those attitudes you mentioned. America certainly isn't perfect but neither is it the big bad guy some believe. And bowing down to this guy? Good grief. Glad I didn't look into this any further. I don't have much more to say except that I'm pretty sure this book would annoy me too--and that I love it when you go on rants! Hmm. That's interesting. I found the book fascinating and couldn't put it down. I'll admit to NOT being surprised when news surfaced questioning Mortenson's accomplishments. However, I thoroughly enjoyed the window it provided into a country of which I have so limited a view. Having traveled to the far reaches of the world some myself, I can say from experience that when I come home to the United States, I DO find an overwhelming sense of selfishness, consumerism, and tunnel vision, as if America's problems are the worst in the world. The fact of the matter is that if I have change in my pocket and shoes on my feet and can read, I'm in the 10 5% of the world's wealthiest people. Reading books like Three Cups reminds me how much I have and makes me that much more thankful. It also reminds me to pray for those whose lives are so desperate. This book's not for everyone, true. If one does choose to read it, one should read it with a critical and discerning eye, of course. It does have redeeming qualities, though. I think we can agree to respectfully disagree with one another on this one. Ugh, sounds like the sort of book that frustrates me greatly. We can so easily let the focus be about US or the THING we're doing rather than keeping it where it belongs, can't we??!!! Hmmm, well, I read this book not too long after it came out and didn't have anywhere near the same reaction. Perhaps it's because I do tend to agree that American's as a whole are generally too internally focused and don't understand the world well. The insights into the Muslim culture and just that part of the world were fascinating to me. I suppose this is a personal bias as my in-law family has lots of years of living in a Muslim culture and they've changed my perspective... a LOT. I'm sure I'm not as discerning a reader as you at times, but I guess I tend to overlook some things and go for the overall affect. If he's done even half the things the book claims he's done then I think he's used his life well, whether or not it comes across as arrogant in a book that he didn't even really write. I haven't looked into the recent controversy, but am aware of it. I wonder if it isn't a combination of a person being really disorganized (I know, I live with one of them, and until I did I could not possibly fathom how you couldn't keep track of your stuff or be somewhere when you said you would) and the author's bent towards exaggeration in story-telling? Anyway, I think the thing I got most out of the book wasn't so much about him as about that part of the world. Which was definitely a learning experience for me and helps me put things in some frame of reference when I hear news reports coming from there.